North Star African Violet Council Twin Cities: Violets In Windows!!! 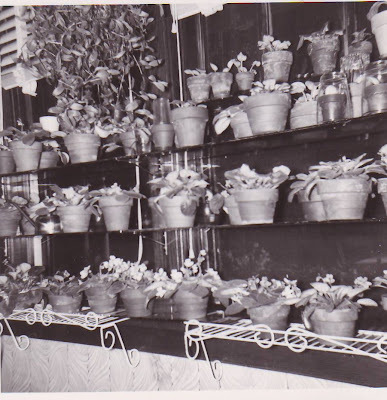 I found this old picture of my mothers' violets growing on shelves on windows. It was taken before 1954 because she moved away that year. Note how all the plants are in clay pots, which is the way they grew them back then. As I recall when she watered the plants some water would spill on the shelves so she would have to wipe up the water but it was not a problem since it was glass. Once in awhile she would take all the plants off the shelves and clean the glass. A big job indeed. The window faced the south. She would close the blinds when it got real hot. Windows at that time were not E windows so how they never burned was a surprise, or maybe they did but I don't remember. The lowest shelf always fascinated me because the supporting bracket pulled up and away. Kids liked things that moved. The shelves and brackets are no longer around. I thought you might like to see how violets were grown many years ago …or maybe some still do it that way.